A Berkshire motorist interested in green issues has said his trial of a new electric car was "a success". Peter McManners, from Pangbourne, has been driving the Oxford-built Mini E car to test the electric car's suitability to everyday motoring. He was one of 20 drivers in the trial, run by a consortium led by the car's manufacturer BMW. Mr McManners said: "I've enjoyed having it but we've had to fit around its limitations, like its lack of range." The left-hand drive, two-seater prototype is like a conventional Mini car, but its rear seats have been removed to make room for lithium-ion batteries. Mr McMannners said he found the lack of rear seats a problem, as he has children. The car can be charged by a 32-amp charger at a cost of around £1.50, and can run for approximately 100 miles (161km). The trial was only open to motorists in a specific geographical area between Andover, West London and Oxford. It cost £330 a month to lease the car. Project leader Suzanne Gray from BMW said: "We're learning not just about electric vehicles but about product development, developing and managing the electricity grid and a charging infrastructure for vehicles." Data collected from the trial will be analysed by Oxford Brookes University's Sustainable Vehicle Engineering Centre. 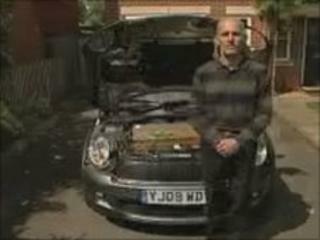 The electric-powered Mini car is likely to go into general production in 2013. What is it like to live with an electric car?